Quick Study: Olga Slavnikova’s fiction braids together complex strands of metaphor and fantasy: Slavnikova considers fantasy a necessary tool for conveying the truths and undercurrents of contemporary Russian reality. The Slavnikova File: Slavnikova won the 2006 Russian Booker Prize for 2017, a novel with elements of fantasy, romance, and suspense that takes place in a fictionalized version of her native Urals and draws on local folklore. Her Light Head was shortlisted for the 2011 Big Book and 2012 Russian Booker awards and won Book of the Year in the prose category at the 2011 Moscow International Book Fair. 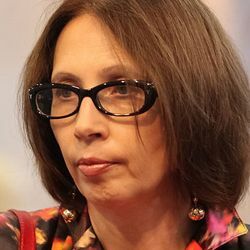 Her earlier works include the novels A Dragonfly Enlarged to the Size of a Dog (1996) and Alone in the Mirror (1999), which won the Pavel Bazhov Prize. Slavnikova, who has worked as an editor and journalist, is also director of the Debut Prize, which recognizes young writers. Psssst………: When the first of two installments of Slavnikova’s Light Head was published in the literary journal Znamia, the journal didn’t add the notation “continuation to follow” at the end, leading to confusion among critics. Slavnikova wondered, in an interview, if critics all actually read the books they review. Slavnikova’s Places: Yekaterinburg (formerly Sverdlovsk), where Slavnikova lived until 2001 and which she used as a model for the Riphean Mountains in her 2017. Moscow. Slavnikova on Slavnikova: Slavnikova called her Light Head a risky book, citing her concern (which came true) that critics would consider it a light genre because its main character is “office plankton.” Slavnikova says, though, that risk is crucial to developing as a writer. On Writing: In an interview with Voice of Russia, Slavnikova said that when young writers ask her about the writing life, she tells them to work other jobs and earn enough so they can write what they want to write, not try to fit the market. She sees the actual process of writing—not awards or status—as an author’s best source of satisfaction. Slavnikova Recommends: Slavnikova has recommended Dmitry Bykov’s Ostromov, or the Sorcerer’s Apprentice, noting that Bykov draws on traditions of grotesque fantasy that began with Gogol and Bulgakov. She also calls Alexander Terekhov’s Stone Bridge an interesting historical reconstruction, despite some heavy reading. When asked about non-Moscow writers, she praised Zakhar Prilepin and Aleksei Ivanov, both of whom she says are authentic in their own ways. Anthologies and journals include: “The Secret of the Unread Note” was published in War & Peace (Glas, 2006, tr. Andrew Bromfield), “Substance” appeared in Subtropics (2009, tr. Marian Schwartz), “Love in Train Car No. 7” is in Chtenia/Readings (winter 2009, tr. Marian Schwartz), and “Basileus” is in Read Russia! (2012, tr. Andrew Bromfield). “The Russian Bullet” appeared in The American Reader (October 2012, tr. Marian Schwartz).